The Microsoft® Interface Definition Language (MIDL) defines interfaces between client and server programs. See more information here. You can create a IDL file using MS Oleview.exe - OLE/COM Object Viewer. This administration and testing tool browses in a structured way, configures, activates, and tests all Microsoft Component Object Model (COM) classes installed on your computer. Download it from here. 1. Create IDL file you need using Oleview.exe: OLE/COM Object Viewer. 2. Create Clarion INC file and TRV file (tree structure file, the same file name as for INC file but with the "trv" extension) using EasyCOM2INC generator. 3. From EasyCOM2INC generator launch EasyClassGenerator utility. 4. Use EasyCom Template to add created class into your application. You can try EasyCOM2INC by yourself. 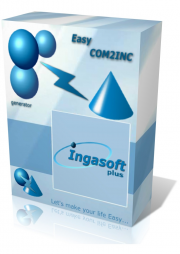 With the Trial (DEMO) version of EasyCOM2INC you can evaluate all possibilities of our product with unique limitation: you could not open a IDL file larger then 10Kb. To remove all limitation you should buy and register the program. Using Microsoft VBScript Regular Expressions Interface (VBScript.idl). MSCal is an example application using ICalendar interface (MSCAL.OCX). ShockWave is an example application using of IShockwaveFlash interface. WMPlayer is Windows Media Player example. XPdfViewer is an example application using XpdfViewer ActiveX control. Using EasyCOM2INC generator, EasyClassGenerator utility and EasyCom Template (Clarion 6.1 only). Note. These example applications are used not complex COM objects so it is not necessary to make any modification in the generated ecom2inc/ecg code. If you plan to implement complex COM object you should refer Documentation for that COM object in order to check if it possible. DHTML - using "DHTML Edit Control (any versions)". HTML editor based on the standard Microsoft dhtml ocx. You can create and edit HTML files, load it from Internet, insert Tables, hyper links etc. See how to work with SAFEARRAY OLE type in ShowContextMenu event handler. Slider - using "Microsoft Windows Common Controls 6.0 (SP6)" - slider control, standard Track bar (Slider) control implementation (abcomctl.app for ABC, cwcomctl for Clarion). RegExp - using "Microsoft VBScript Regular Expressions 1.0". MS Agent - using "Microsoft Agent Control 2.0". MS Windows Common Controls - Status bar Control & Progress bar Control. Makes it easy to use Windows Script Host Object Model, almost like in VBScript; 15 helper classes; shows how to control the file system (local / remote discs, folders, files, run files, full information about the objects file sistem, creating Shortcuts, access to environment variables). Send email / SMS from your application. Microsoft® Collaboration Data Objects (CDO) is a technology for building messaging or collaboration applications.